Click the arrow on the right-hand side of the e-magazine above to flip through! 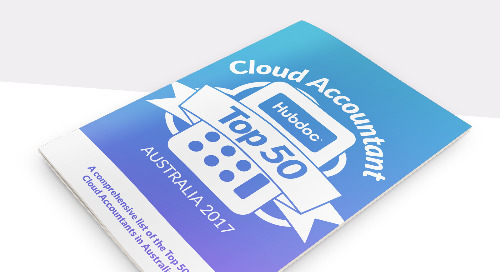 Each year, the Hubdoc team assembles a list of the Top 50 Cloud Accountants in North America – accountants and bookkeepers who are leveraging cloud accounting technology in new and exciting ways. The accountants and bookkeepers featured on our Top 50 list embrace technology to excel in many areas of modern practice management (growing their firm, hiring the right talent, defining their niche, building an efficient tech stack, and so on). We wanted to showcase their expertise and share their stories so you can learn from them! Click the arrow on the right-hand side of the e-magazine above to flip through and learn more! You can also view the e-magazine in fullscreen – click the "expand" button in the bottom right corner to do so (it looks like this: ). Subscribe to the Hubdoc blog to get more insights from cloud accounting leaders!